Functional responses to changes in rabbit abundance: is the eagle owl a generalist or a specialist predator? How foraging behaviour of predators is influenced by prey abundance is often not clear. Predators may behave as generalist or specialist depending on the relationship between the predator feeding behaviour and prey abundance, known as functional response. The European rabbit (Oryctolagus cuniculus) is a key species for most Iberian vertebrate predators, especially for large raptors such as the eagle owl (Bubo bubo). 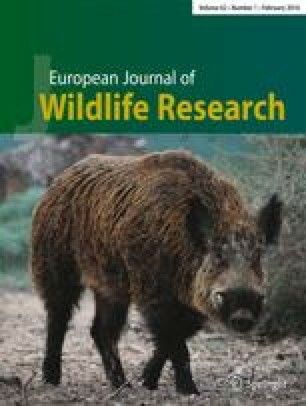 The eagle owl functional response was analysed in central Iberian Peninsula by fitting different models (null, linear, two asymptotic and two sigmoidal models) between rabbit abundance and rabbit consumption by the eagle owl. Rabbit consumption increased as did its abundance until reaching an asymptote. Rabbit-consumed biomass better fitted to a type II functional response (convex, typical of specialist predators), whereas rabbit frequency in eagle owl diet better fitted to a type III functional response (sigmoidal, typical of generalist predators). Trophic diversity increased as rabbit abundance decreased. The consumption of other prey, such as Iberian hare (Lepus granatensis) and medium-size birds (mainly galliformes and columbiformes), increased as rabbit abundance decreased. The eagle owl is highly dependent on rabbits in central Spain, even at low rabbit abundance. In this situation, the eagle owl diversifies its diet, making it difficult to define the eagle owl as a specialist or as a generalist predator. Therefore, the eagle owl in the centre of the Iberian Peninsula should be rather considered as a facultative predator on wild rabbits. The online version of this article (doi: 10.1007/s10344-015-0976-7) contains supplementary material, which is available to authorized users. This study is a partial result of CGL2005–02340, CGL2009–10741, and CGL2013-43197 projects, from I+D National Plan funded by the Spanish Ministry of Science and Innovation and EU–FEDER funds. J. Fernandez-de-Simon benefitted from a FPI PhD scholarship (BES–2006–12562) funded by the Spanish Ministry of Science and Innovation and the European Social Fund. J. Fernandez-de-Simon and F. Diaz-Ruiz are currently holding a postdoctoral fellowship from Junta de Castilla-La Mancha and the European Social Fund (Operational Programme FSE 2007/2013). We are indebted to the landowners of estates where field work was carried out and to the staff of Lagunas de Ruidera Natural Park, especially Manolo López for his support during field work. We thank Pedro Peiro for providing rabbit biometric data for body weight estimation of rabbit remains in owl pellets. We are indebted with many people that helped in field work, being mainly F. Buenestado, A. Camarero, J. Cañadilla, F. Castro, M. Delibes-Mateos, C. Ferreira, J.L. García-Moreno, L.E. Mínguez, E. Ramírez and C.A. Ríos-Saldaña, and C. Rouco. R.P. Pech, G. Forrester and C. Jones (Landcare Research, NZ) provided useful knowledge for fitting non-linear models in R.